Nails come in a variety of shapes and sizes and everyone has fingers and nails of different lengths and shapes. Some have long, slim fingers while others have short fingers with short nail beds and every combination in between. 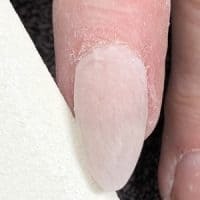 A good nail tech knows how to complement a client’s natural features and the foundation of this is choosing a nail shape that makes the most of, and enhances, the client’s natural nail and finger. Most clients lean toward one of the five basic shapes: square, squoval, tapered square/ballerina, almond or rounded. Essentially, all these shapes are from the basis of a square or rounded shape with just slight adjustments to alter them. Read of my previous Scratch blog on how to create these shapes by clicking here. So, how do you know which shape to choose for which client? Square is typically seen as the classic L&P shape — straight side walls, two sharp points on the tips, and a deep C-curve. However, a true square shape is difficult to pull off when the natural nail or fingers aren’t slim and straight and instead, tend to be short and wide. A sharp square nail can actually make the nail appear shorter and stubbier and can be difficult for many to pull off, especially if the client is wanting just a short extension. The squoval nail is essentially a traditional square shape but with the softer edges of an oval — hence the name squoval and can be more flattering than a traditional square shape. An oval, round or almond shape is an attractive shape for most hands as it can work on both long and short nail beds whilst giving the illusion of an elongated nail and finger as the eye is drawn to the point. Most clients can pull this shape off but the point should be tailored to suit that individual client’s lifestyle. 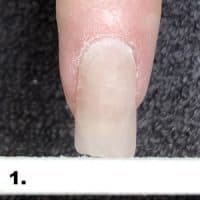 This shape is for those used to nail extensions but more typically seen in competition work. A true stiletto has a minimum length which usually exceeds a standard form. The side walls come straight out to a pointed free edge and from the apex the product comes straight down to the free edge. The side walls are not rounded like an almond shape, this just makes a long almond. A popular look for those who like something modern or a square nail but need the elongation of the tapered sides. The name comes from the look of a ballerina shoe ‘on point’. Many clients request this shape when in fact they actually mean a tapered square or ballerina shape. A true coffin shape has a very defined shape at the free edge which isn’t a very balanced shape. 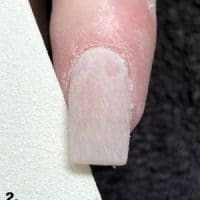 Your client may have their mind set on a particular shape that may not always suit them but as a nail tech we can make sure we guide them and advise them to the most flattering shape for them. 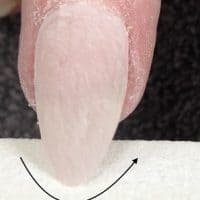 When filing nail shapes on enhancements, it is important to remember that the way your form is fitted and how you build the product is paramount for the correct shape and longevity of the structure. You cannot alternate between shapes with just a filing technique otherwise your apex placement as well as your lower and upper arches will be incorrect leading to premature service breakdown. The way you hold your file is important when filing all parts of the enhancement, including your sidewalls/lower arch, parallel sides, apex and free edge. 1) Hold the file at a 45-degree angle from the extension to the free edge and slowly roll up. 2) From there, file around the free edge to create either a pointed or rounded end to suit your client. 3) To file the parallel sides, hold your file flat and move back and forth from free edge to cuticle. Repeat this step on the other side, whilst ensuring you keep checking your free edge thickness. 4) Move to the centre and file in the same way from free edge to apex (back 1/3). Refine with a 180-grit file in a polishing movement from one side all the way to the other to ensure an even curve. Your upper arch should come down completely straight from the apex to the free edge at a 45 degree angle. Your upper arch and lower arch should create a triangle shape. The filing technique is similar to above, but your lower arch must be absolutely straight. Follow steps 1, 3 and 4 from above. Don’t be tempted to try to round the tip or sidewalls, these should come out absolutely straight and to a perfectly sharp point. Turn the finger on its side so you don’t over file this and in turn your lower arch tapers upwards. Refine with a 180-grit file in a polishing movement from one side all the way to the other to ensure an even curve. Your upper arch should come down completely straight from the apex to the free edge at a 45-degree angle. Your upper arch and lower arch should create a triangle shape. To file this shape, begin with the free edge then the side walls. 1) Hold your file completely straight against the free edge to create the true square shape. 2) To file the side walls, turn the client’s finger on its side and then, hold the file at a 45-degree angle from the extension to the free edge and slowly roll up, making sure the lower arch is absolutely straight and parallel with the side of the finger and not dipping down. 3) To file the parallel sides, hold your file flat and move back and forth from free edge to cuticle. Repeat this step on the other side, whilst ensuring you keep checking your free edge thickness. This is the same techniques as the above shapes. 4) Move to the centre and file in the same way from free edge to apex (1/2 extended pink). Refine with a 180-grit file in a polishing movement from one side all the way to the other to ensure an even curve. Your upper arch should come down completely straight out from the apex to the free edge and not curve at all. Your upper arch and lower arch should create a rectangular shape. A squoval nail is built in the same way as a traditional square but when filing the free edge, tilt the file underneath the corners. File the same as a square but angle your file more on the tapered edges. To file the parallel sides, follow the steps from the other shapes. The apex is in the back 1/3. Your upper arch should come down completely straight out from the apex to the free edge and not curve at all. Your upper arch and lower arch should create an upside down triangle.